Step 1: Mix the sugar, oil, salt and water in a large bowl until everything’s dissolved. Step 2: Add 3 cups flour and mix. You will not necessarily be able to get rid of all the clumps of flour yet; that’s okay; just keep going. Step 3: In a separate, small bowl, combine 1 tablespoon INSTANT yeast with one cup of flour. After the yeast has been thoroughly mixed into the cup of flour, add the mixture to the dough. Step 4: Continue adding flour, between 2 and 4 more cups. As your mixture becomes more solid, add the flour more and more slowly. Add flour until you reach the point when, if you press the dough gently with clean fingers, no dough sticks to your hands. Step 5: Let the dough rest for 10 minutes. Take a break! Then knead, using the heel of your hand, not your fingers) for 6 minutes. (You may have to add some flour while kneading, but be conservative.) Step 6: Put the dough back in the bowl, cover with oil and then drape a towel over the bowl, and let it rise for at least one hour (but monitor it to make sure it doesn’t overflow the bowl). You can let the dough rise overnight in the fridge (the rising process slows down in cooler temperatures). Step 7: Braid and, if desired, egg wash and add salt and sesame/poppy seeds. If you have time, let the loaf rise before you bake it. Bake at 350 until golden-brown (30-45 minutes). 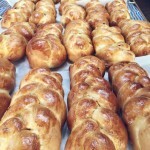 This recipe makes 16-18 “challah knots” where four knots are about equal to 1 family-size loaf. 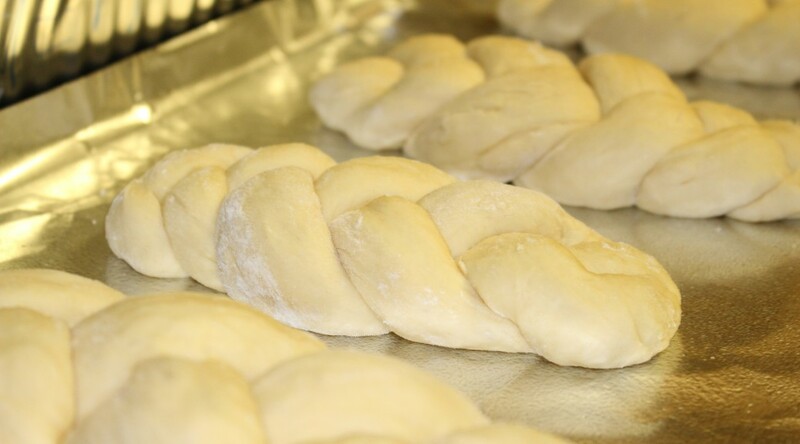 The consistency of the dough is not conducive to braiding, so rolls, or knots, are recommended. It is important to note that if you intend to sell gluten-free bread to those with celiac disease, it is important that the bread not come into contact with ANY flour, even trace amounts. 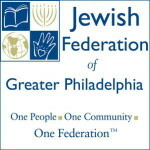 This may require having separate equipment specifically for this purpose or thoroughly cleaning all equipment and your work area before making any gluten-free challah. Otherwise, it’s important to be clear when selling that the product is not 100% gluten-free. Even trace amounts can make a celiac sick. Step 1: In mixer, combine the flours, 1/4 c sugar, xantham gum, and salt. Step 2: In another bowl, dissolve the 2 tsp sugar in the 2/3 cup of water and mix in the yeast. Step 3: In a third bowl combine the melted butter with the additional 1 cup water and vinegar. Step 4: With mixer on low speed, blend the dry ingredients. Slowly add the butter/water mixture. Then blend in the eggs, 1 at a time. The dough should feel slightly warm. Step 5: Pour the yeast mixture into the ingredients in the bowl and beat at the highest speed for 2 minutes. Step 6: Place the bowl in a warm spot, cover with greased plastic wrap and a towel, and let rise approximately 1 hour. Step 7: Return the dough to the mixer and beat on high for 3 minutes. Step 8: Spoon the dough into a greased muffin tins or onto a pan in about fist sized blobs (Should produce about 18 rolls). A filling can be folded into each roll or the tops can be sprinkled with sesame seeds or salt. Let the dough rise for about 30-60 more minutes. Step 9: Preheat the oven to 400 F and bake the rolls until golden 15-25 minutes. Step 1: Mix in 1 jar (about 6.5 ounces) of Kosher pesto, making sure that the pesto is enriched into the dough. OPTIONAL: Add a pinch or two of Kosher grated parmesan cheese into the mix and mix thoroughly. Step 2: Let dough rise for about 3-5 hours and then braid however which way is desired. **Oven times are approximate** Step 3: Bake in oven at 375 for 10 minutes, rotate the challah, and cook for an additional 5-10 minutes. Step 1: Mix ¾ cup sugar, ½ cup oil, ½ tbsp. salt, and 2 ½ cups of water in a large bowl. Then add in 3 cups of flour and mix in. In a separate bowl mix together 2 ½ tsp. yeast and 1 cup of flour. Then add this to the dough mixture. Slowly mix in 3 more cups of flour. Then coat with about 1 tbsp. of oil and cover tightly with foil or a cloth. Step 2: Let dough rise for at least an hour. Step 3: Bring 16 cups of water and ½ cup baking soda to a boil in a large pot. Preheat the oven to 350 degrees. Step 4: Cut dough into balls of 200 grams. Flatten balls and add in 1/8 teaspoon of salt. Knead and fold to incorporate the salt into the dough. 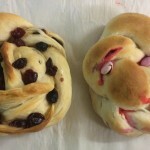 Then roll dough into “snakes” and twist two together to form a round challah. Step 5: Next, submerge in the boiling water, one loaf at a time, for 1 minute. Then remove and dab dry with a clean cloth. Step 6: Sprinkle with sea salt and bake for 30-35 minutes at 350. 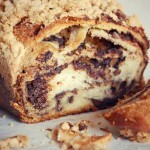 The challot should turn a dark brown color on the outside. Step 7: Jump up and down screaming “Pretzel! Pretzel! Pretzel! Pretzel!” and enjoy! This recipe makes 4 family-size loaves. Step 1: Put half the sugar in a small bowl w/ half the water. Add yeast and mix. Leave on the table. Step 2: Sift white flour and 3 ½ cups of whole wheat flour w/ salt and the rest of the sugar in a large bowl. Step 3: Mix in the eggs, oil and other half of the water. Then add the yeast mixture. Step 4: Knead the dough and keep adding whole wheat flour until the dough does not stick. Step 5: Coat the dough in about a tsp of oil and place it in the bowl. Cover the bowl with a damp towel if you’re in a dry climate, otherwise you can use saran wrap if you prefer. Let it rise for at least one hour (but monitor it to make sure it doesn’t overflow the bowl). You can let the dough rise overnight in the fridge (the rising process slows down in cooler temperatures). Step 6: Punch the dough down and remove it from the bowl. It should make approximately 4 family sized loaves. 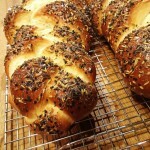 Braid and, if desired, fill and/or egg wash and add salt and sesame/poppy seeds. If you have time, allow it to rise for another 30 minutes to an hour covered by a damp towel or saran wrap. Step 7: Bake for approximately 30 minutes at 350 degrees. The following recipe uses INSTANT yeast. If you are using active dry or another kind of yeast, you will need to make modifications. This recipe makes 2 family-size loaves. Step 1: Mix the sugar, oil, salt and water in a large bowl until everything’s dissolved. Step 2: Add 2 cups whole wheat flour and 1 cup of white flour and mix. You will not necessarily be able to get rid of all the clumps of flour yet; that’s okay; just keep going. Step 3: In a separate, small bowl, combine 1 tablespoon INSTANT yeast with one cup of white flour. After the yeast has been thoroughly mixed into the cup of flour, add the mixture to the dough. Step 4: Continue adding whole wheat flour, between 2 and 4 more cups (if you have already added 3 additional cups of whole wheat flour, you may want to use some more white flour, before whole wheat, as too much whole wheat flour will make a dry, dense loaf). As your mixture becomes more solid, add the flour more and more slowly. Add flour until you reach the point when, if you press the dough gently with clean fingers, no dough sticks to your hands. Step 5: Let the dough rest for 10 minutes. Take a break! Then knead, using the heel of your hand, not your fingers) for 6 minutes. (You may have to add some flour while kneading, but be conservative.) Step 6: Put the dough back in the bowl, cover with oil and then drape a towel over the bowl, and let it rise for at least one hour (but monitor it to make sure it doesn’t overflow the bowl). You can let the dough rise overnight in the fridge (the rising process slows down in cooler temperatures). Step 7: Braid and, if desired, egg wash and add salt and sesame/poppy seeds. If you have time, let the loaf rise before you bake it. Bake at 350 until golden-brown (30-45 minutes). Step 1: Add 6 Cups of flour and 1TBSP of salt to large bowl, MIX together. Step 2: In a small bowl: Add 3 TBSP of dry yeast, ½ cup of hot water, small handful of sugar. *Stir and wait 5 minutes until there is a foam layer on the top* Step 3: Make a well in the large bowl and ADD 1¼ cups of sugar, 1 cup of vegetable oil, 3 eggs, 2 cups of cold water, 1 ½ cup of hot water. MIX together those ingredients inside the well, wait till the sugar dissolves THEN add the YEAST mixture and MIX with flour in the bowl. Step 4: Keep adding flour, small amounts at a time until the mixture no longer looks glossy. Step 5: When braiding, cut up bananas in half and then in half again and make the pieces small enough to roll into the dough once the dough has risen. Mix the small pieces of banana with brown sugar until the banana is completely covered. 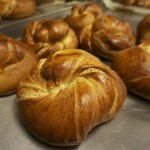 Sprinkle a layer of brown sugar on the dough and then add the banana brown sugar mixture, seal and roll the challah. Step 1: Use the basic recipe to make challah dough. This recipe makes 3-4 loaves. Ingredients 1 and a half cups of water 5 large egg yolks 1 and 1/8 teaspoons salt 1/3 cup oil 4 and 1/4 cups of flour 1/2 cup sugar 1 tablespoon active dry yeast 1 large egg, lightly beaten (1 cup) chocolate chips**, (2 tablespoons) peanut butter, (1/2 cup) craisins and (1/4 cup) coconut shavings (recommended amount in parentheses but add according to your taste) ** chocolate chips can be milk, dark, white, parve or a combination depending on your preference and dietary restrictions! Step 1: Activate the yeast by pouring it into a smaller bowl with 1/4 of warm water and leaving it out to sit for 15 min while you make the rest of the mix. Step 2: Add flour, egg yolks, oil, sugar, salt, and the rest of the water in a large mixing bowl. When the yeast is ready (frothy) add that to the mix as well. Step 3: Mix and knead the dough mixture in the large bowl. Step 4: Allow the dough to rise in a warm place for at least an hour. Step 5: When the dough has risen, you may separate the dough into 3-4 even amount and prepare to braid by creating three even strands. Step 6: Flatten out the strands and add some peanut butter, chocolate chips, craisins and coconut to the very center of the flattened strands (leave room extra dough on either side of the special ingredients). Then close up the strands by bringing the extra dough flaps on either side around and pinching them together on top so that the special ingredients and completely covered and surrounded by the dough. Step 7: Braid the (now loaded) strands. Step 8: Brush the large beaten egg over the braided challah. 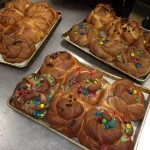 You may add a few extra chocolate chips or coconut shavings on top of the egg washed challah for a garnish. Step 9: If you can, allow the challah to rise for 10-20 min more on the preheating oven. Bake the challahs for around 30 mins at 350 degrees. Step 10: Enjoy! The following recipe uses INSTANT yeast. If you are using active dry or another kind of yeast, you will need to make modifications. 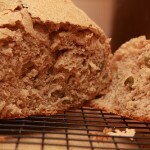 This recipe makes 24 loaves (1 pound each). Step 1: Mix the sugar, oil, salt and water in a large bowl until everything’s dissolved. Step 2: Add 15 cups flour and mix. You will not necessarily be able to get rid of all the clumps of flour yet; that’s okay; just keep going. Step 2.5: Add cinnamon, cocoa powder and chili powder to the mix. Step 3: In a separate, small bowl, combine 5 tablespoon INSTANT yeast with one cup of flour. After the yeast has been thoroughly mixed into the cup of flour, add the mixture to the dough. Step 4: Continue adding flour, between 2 and 4 more cups. As your mixture becomes more solid, add the flour more and more slowly. Add flour until you reach the point when, if you press the dough gently with clean fingers, no dough sticks to your hands. Step 5: Let the dough rest for 10 minutes. Take a break! Then knead, using the heel of your hand, not your fingers) for 6 minutes. (You may have to add some flour while kneading, but be conservative.) Step 6: Put the dough back in the bowl, cover with oil and then drape a towel over the bowl, and let it rise for at least one hour (but monitor it to make sure it doesn’t overflow the bowl). You can let the dough rise overnight in the fridge (the rising process slows down in cooler temperatures). Step 7: Add chocolate chips to strands and braid. Step 8: If desired, egg wash and add salt and sesame/poppy seeds. If you have time, let the loaf rise before you bake it. Bake at 350 until golden-brown (30-45 minutes). Step 1: Add the oil, sugar, salt, and water together in a big bowl. Make sure it is completely combined. Step 2: Add 3 cups of flour and mix thoroughly (it is okay if there are some lumps in the batter, just make sure all the flour is combined). Step 3: Add the instant yeast with another cup of flour and combine with the batter already mixed. After that is done, add 2-3 more cups of flour. Step 4: Knead the dough with your hands, it cannot be too sticky. Step 5: Cover the dough in a little oil and a towel. Let the dough rest for at least an hour. Step 6: Preheat oven to 350 degrees. Split dough into 2 equal sized “snakes” and flatten them out. 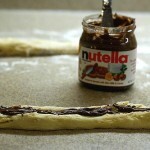 Then take your Nutella from the jar and spread a generous amount down the middle of the “snake.” Pull the sides of the dough out and around the Nutella and pinch the top together. Go down the length of the “snake” until it is completely closed. Then twist the two “snakes” together and twist it in a circle. 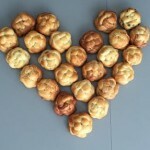 Bake challahs for 15-20 mins. For the filling [for 6-8 loaves) 1 cup / 2 sticks unsalted butter 1 ½ cup dark chocolate chips or chopped dark chocolate 1 cup powdered sugar 2/3 cup cocoa powder Melt butter and chocolate together until smooth (I did this in the microwave at 30-second intervals). Stir in powdered sugar and cocoa until smooth. 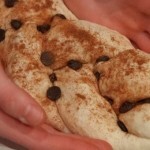 Roll out a strand of dough, flatten the strand, and spread a layer of filling on the strand. 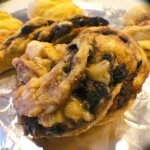 Starting at one end of the strand, fold the dough over itself to enclose the filling within the strand. Recipe from Amy Kritzer, "WhatJewWannaEat"
Instructions: 1. In the bowl of an electric mixer, whisk together the warm water, sugar and yeast. Mix in half of the bread flour (70 g), cover with a kitchen towel and let the "mother" rest in a warm spot for at least 1 hour. 2. Add the remaining bread flour, all-purpose flour, honey, olive oil, 2 eggs, yolk and salt to the mother mixture. Using the dough hook attachment, mix on low for 3 minutes until the dough comes together. Turn the mixer up to medium-high and let the mixer do the kneading work for 2 more minutes. 3. Remove the dough from the mixer bowl and shape it into a tight, round ball and place it in an oiled bowl (I cleaned the mixer bowl and used that). Cover with a kitchen towel and place it back in the warm spot. Let it rise for 2 hours or until doubled in size. 4. Section off the dough into 3 or 6 equal balls and roll them into strands (I did 6). 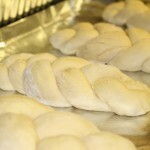 Braid the challah with 3 or 6 strands and transfer to a greased (or parchment lined) baking sheet. 5. Whisk the remaining egg with a splash of water to make the egg wash. Brush the challah with the egg wash, making sure to get the nooks and crannies and all around the sides. Save the egg wash. Cover with the kitchen towel and let it rise in that warm spot for at least an hour until double in size. 6. Preheat the oven to 350 degrees F (175 degrees C). Combine the poppy seeds, sesame seeds, garlic flakes, onion flakes and salt in a small bowl. 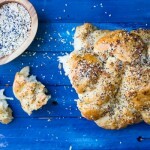 Brush the challah with the egg wash again and sprinkle the topping all over the challah. Bake for 30-35 minutes until golden. Rotate the pan once through the baking for even browning. When you tap on the bread it should sound fairly hollow. 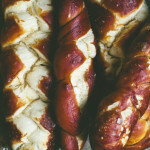 Jalapeño Cheddar Challah recipe from "The Frugal Ima"
Brown Sugar Challah with Pomegranate Glaze Recipe and Photo From My Name is Yeh - Delicious! Ingredients Makes one loaf. In a measuring cup or small bowl, combine the water, yeast, and 2 teaspoons of brown sugar. Let sit for a few minutes until it gets foamy on top. Meanwhile, in a large bowl or bowl of a stand mixer fitted with the dough hook, mix together 1/4 cup of brown sugar, the 3 cups of flour, salt, and cardamom. In a separate bowl, mix together the oil and 2 of the eggs. When the yeast has proofed, add it to the dry ingredients, immediately followed by the egg mixture. Mix to combine and knead, either on a floured surface, or with the dough hook for 7-10 minutes, adding more flour as needed, until smooth. Transfer to an oiled bowl, cover with a damp towel, and let rise until doubled in size, about 2 hours. Turn onto a lightly floured surface, and roll the dough out into a large (approximately 10-inch by 14-inch) rectangle. 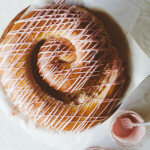 Sprinkle on the remaining cup of brown sugar, and roll it up like a jelly roll. Pinch the edges to seal them shut and then coil into a swirl shape with the seam side down. Place it on a baking sheet lined with parchment. 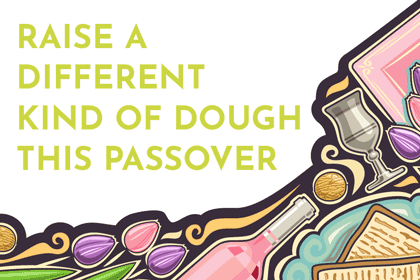 Beat together the remaining egg with a splash of water and brush it lightly onto the challah. Let it rise for 30 more minutes while you preheat the oven to 375. 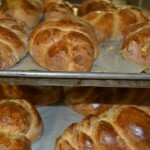 Bake the challah until it’s golden brown and cooked through, about 35-40 minutes. Because this challah is round, it will take slightly longer to bake than a typical loaf. It may look done on the outside after about 20 minutes, but it will still be raw on the inside. If you’d like, you can tent the loaf with foil after 20 minutes to prevent it from getting too done on top. When it’s done baking, let it cool and make the glaze. To make the glaze, mix the powdered sugar with 2 tablespoons of pomegranate juice. Add more until you reach your desired consistency. Drizzle or pour it on your loaf and enjoy!